Please note that only the Account Owner can upgrade or downgrade the Noko account. 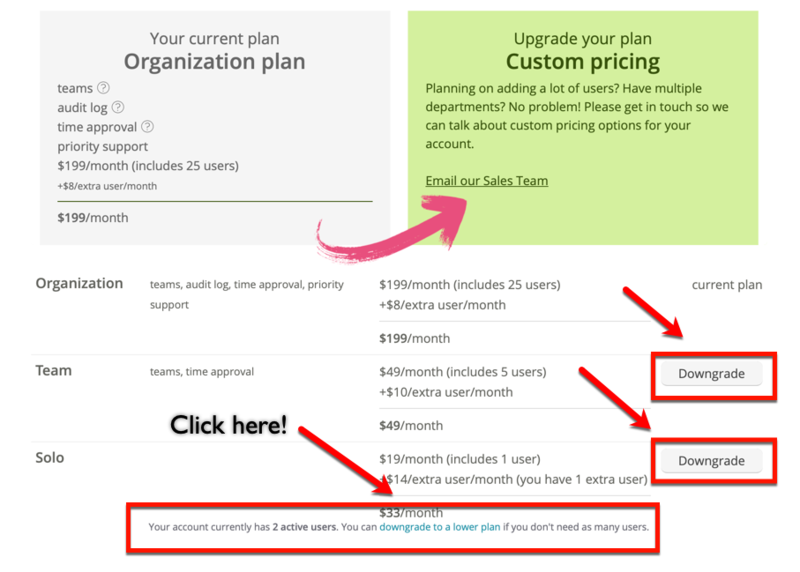 Click the Plans & Billing tab in the green navigation sidebar. 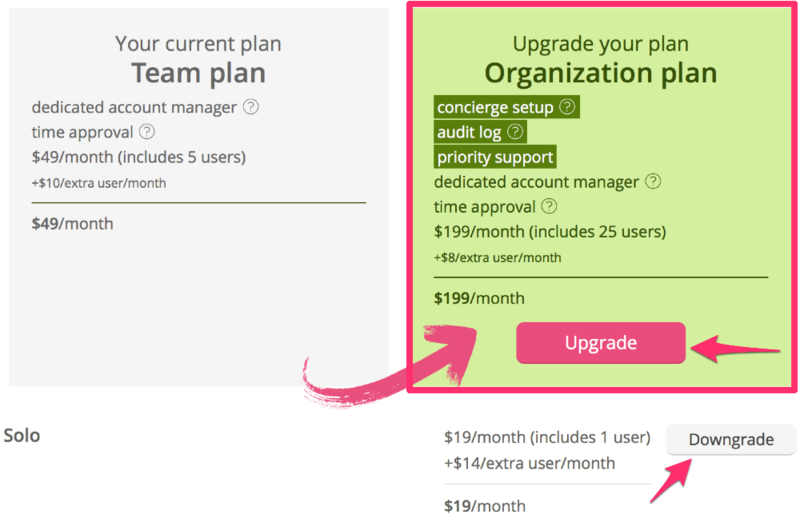 Click on the suggested plan upgrade button or choose another plan further down. You may not have the option to upgrade or downgrade if you're on a custom pricing plan. If you need to change your custom pricing plan, please contact Noko support. If you're not sure who the Account Owner is, go to the "people" tab in your Noko account to find out. What happens when I upgrade to a higher Noko plan? First of all, the extra goodies (like more users!) will be available immediately. You will not be charged the new plan price until your next monthly billing date. You can see your next billing date at the top of the Plans & Billing page. If you paid in advance, the advance payment acts like credit and we'll move the next billing date according to how much is left in your advance payment and how much the new plan costs per day (we've an example in the article on paying in advance). If you upgrade from the free plan to a paid account you will be charged immediately for your next month of service, and then again every month (there's no 14-day trial period if you decide to switch from the free plan to a paid plan). In any case, we will show you a window with detailed information of exactly what will happen when you upgrade. Once you've read the " What will happen details", click the Yes, change my plan button. Under the plan levels you're able to upgrade you, you'll see the options to downgrade to a lower plan. In the list of Noko plans you'll see a "downgrade" button so you can select the one you're interested in. In a free account, you can only have one project, and one user. To downgrade to the free account follow these steps. Make sure there's only one active user (the Account Owner). Make sure there's only one active project. Write us an email and we'll downgrade you. Not to worry, your data won't be lost if you archive users and projects! You can always upgrade back to a paid plan, in which case you'll be charged for the first month of the paid plan immediately upon upgrading.